Oil production cut!! Oh no!!! They cut it to raise the price. Boy did it ever work. 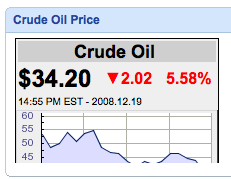 What is oil today? Take a look. That worked well (no pun intended). This just goes to prove there is no logic in our stock/commodity markets anymore. What could it be? Was it good news or no? A last-minute order? A contract? PO? It was someone to see me, offering help at this time! To make the deal sweet and avoid something sour? An Adobe Evangelist! And standing so near! Said, "I have some news that you'll want to know." Sales folks aren't lost in the back with Blackberry. Just the key capabilities, everything else banned." We have to admit we're just a bit slow!" Review these and check - is this still the case? Are we aligned or are we off-base? Illustrate and describe, those are the keys! Make sure it aligns with their mode of consumption. Show us the rest, please do demo." While their Vision Solution you work to enlarge! Leave it up, let it linger, so they'll know what they've seen! "This is all so obvious, it's way clear to me!" Turned 'round and he said, "My job here is done,"
"Great Demo! to all and to all a Great Day!" I am now sitting at the Dubai International Airport (really one of the modern wonders of the world) waiting for a red eye to Frankfurt to get home to Canada. I really enjoyed talking to the local developers and found their level of enthusiasm and knowledge to be world class. Everyone I met was deeply technical and on top of their game. The government in Dubai has done something right to attract this kind of talent and build this kind of infrastructure. I am sad that I am leaving but happy I leave knowing I now have another 100 or so new friends who I got to share time with. We traded code samples, IT stories, advice and architecture ideas around SOA and especially the new Media conference conversations. The new Media idea is one I will encourage everyone not to take lightly. A free and independent media is the cornerstone of a democracy. Once the media becomes controlled by corporate interests, we have lost some of our democracy. Once we have lost part of our democracy, we have lost some of our freedoms. If freedom is worth fighting for (as I believe it is), it is certainly worth paying for. Spend part of my taxes to fund the Canadian Broadcasting System so they can deliver unbiased, impartial news without fear of funding cuts. I like this idea. I am happy also because as I start this long and arduous journey, I am coming back home to my family where I will be able to spend more than 3 weeks before traveling again. Time to take some time off! First - I really want to thank the staff from IIRME at the recent New Media Conference in Dubia. They are pros and treated us all very well. You are hereby granted free use of this material as long as you respect the IP rights of others. Please remove the Adobe logo and my name and replace them with your own name/logo if you plan to present it. Also - this was heavily influenced by problogger.com. Please make sure they get credit as noted within. Special thanks to all the people of Dubai!!! If you have not been here, get here. This place is awesome!! Everyone I have met is 100% friendly to the MAX!